We are engaged in offering a comprehensive range of Twill Fabrics that have been widely acclaimed by our clients. These have high quality features like color fastness, low shrinkage and are skin-friendly. Moreover, the twill fabrics can be availed in either blended or pure cotton forms with the diagonal parallel ribs pattern. These fabrics have become a rage and have a huge demand in the fashion industry. Being a customer focused organization, we are engaged in offering a wide and exotic assortment of Twill Cotton Fabrics. These twill cotton fabrics are admired by the customers for their colorfastness, tear strength, shrink-resistance and longer life. The offered range of twill cotton fabrics is ideal for upholstery, slip covers, draperies and allied. 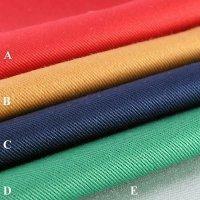 Furthermore, this range of twill cotton fabrics is well known in the industry for its soft and fuzzy textures. Looking for Twill Fabrics ?